In Mexico, chia seeds are often stirred into fruity drinks where they turn gelatinous and add a nice texture to the beverage. Chia was a prized "superfood" by the Aztecs who took advantage of the seed which contains protein, fiber, and omega-3 fatty acids—including high amounts of alpha-linolenic acid. Chia can also be used in breads and baked goods, but making chia fresca is one of the quickest, easiest, and a most delicious way to get some chia seeds into your diet. When the seeds absorb enough liquid, the outer layer creates a gelatinous film around the seed, so you can drink it effortlessly. The seeds themselves have a grassy flavor if you crunch them open, but the jellylike coating keeps the seed intact, preventing the hydrated seeds from imparting any flavor to your beverage. The first step is to prepare the limonda (lemon-water). Pour the water into a glass. Slice the lemon in half and squeeze the juice into the water. Stir in the sugar or add sweetener to taste. Once you have achieved the sweetness level you prefer, it's time to add the chia. Stir the seeds into the lemon water and let it sit for about 10 minutes. (During this time, the seeds will absorb the water and become gelatinous.) You can stir it occasionally if the seeds seem to be floating or falling to the bottom. To serve the chia fresca, add a slice or wedge of lemon and/or a sprig of mint to the glass for garnish. You can also add ice or place in the refrigerator to chill. To get the most juice out of a lemon, before cutting it roll the whole lemon back and forth on the counter while pressing down firmly. Rolling like this for about 10 seconds will help loosen up the juices inside. If using granulated sugar or piloncillo (Mexican raw, pure cane sugar), you may want to dissolve it in boiling water first to make a simple syrup—otherwise, it will take a while for it to dissolve in the cold water. Other sweeteners can be used, such as Natural Stevia drops, Equal, or Splenda; start with a small amount and add more to taste. Fresh chia seeds will float throughout the liquid, while older ones tend to sink to the bottom. It is fine if they sink, but you will just need to stir them up a bit to keep them evenly dispersed. 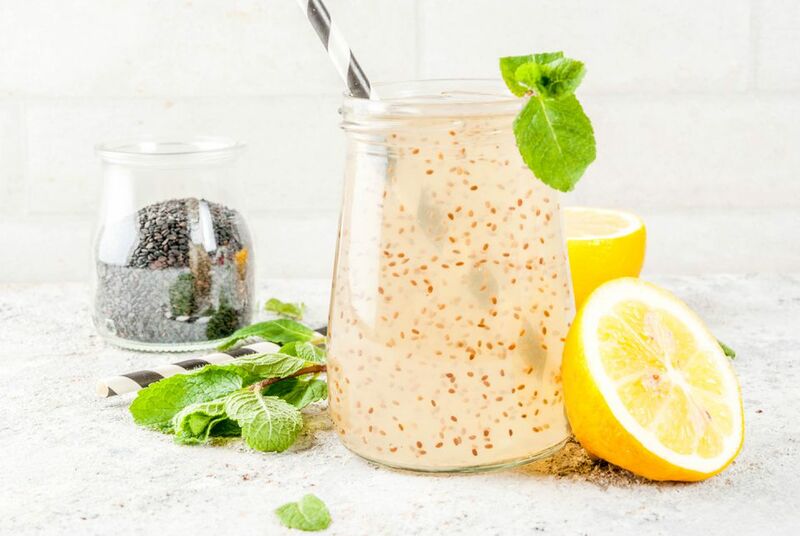 If you would like to make a pitcher of chia fresca, simply increase the ingredients to 48 ounces cold, fresh drinking water, 4 large lemons, 1/4 cup sugar or sweetener of choice, and 2 tablespoons fresh chia seed. Follow the directions for making one glass, adding ice if you prefer. Garnish with whole mint leaves, if desired. Mint is very strong and can be overpowering, so it's best to add it just before serving.